In addition to providing hyper-local eggs right from your backyard- which are fresher, tastier, and more nutritious than those you’ll find in a supermarket- chickens help to complete a natural cycle by eating food waste and producing high quality fertilizer for your garden. Among many other benefits, chickens additionally help to rid your yard of ticks and other undesirable pests. In addition to our gardens, Green City Growers specializes in small-scale coop installation and maintenance. Our in-depth knowledge and understanding of small backyard flocks allow us to provide the best quality coops, birds, and ongoing services available for urban and suburban locations. 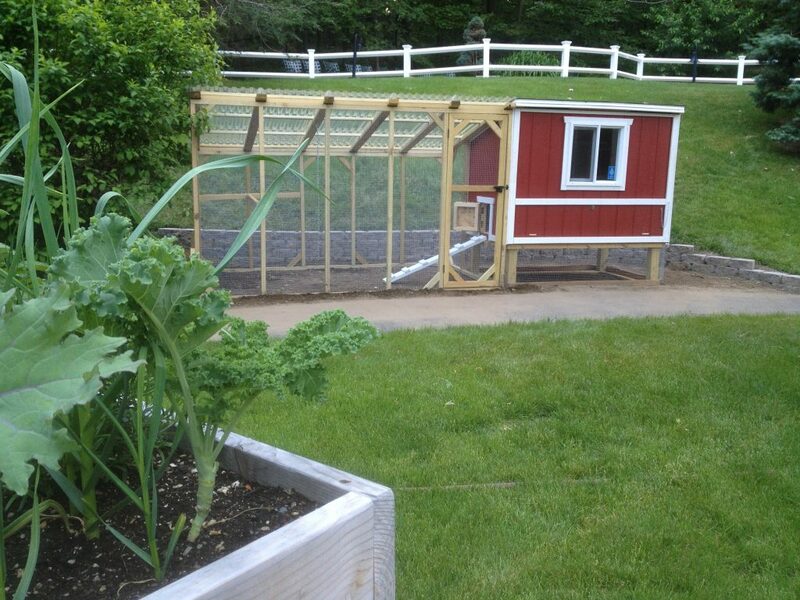 GCG can do all the work necessary to install a chicken coop on your property. Coops are sized depending on the desired number of chickens. Coop packages include coop, feeder, waterer, run, and all necessary features to guarantee your birds are comfortable and safe from pests and predators. Installation includes delivery, placement, leveling, and securing of the coop and run, as well as sunken hardware cloth barrier around the perimeter of the run to ensure safety from predators. Coop designs are customizable. GCG will provide your birds and coop with a monthly check-in to guarantee your chickens are in good health, and your coop stays clean and well-maintained. Monthly maintenance visits are year-round, and include refills of feed and pine shavings as needed, coop cleaning and check-up, and bird health check-up. Having a backyard chicken coop requires you to spend time daily to care for your chickens. Our training session includes a 2hr training session from our chicken specialist, GCG care documents, and two additional follow up visits to ensure your birds are healthy and happy. Birds are delivered at the first session. ‘A la Carte’ Consulting is available for those who already own chickens, or those interested in learning more beyond the basics. GCG will pick help pick the best birds for you! Choose from our list of recommended breeds, or request a custom breed (potentially for an additional cost). All breeds we recommend have relatively docile personalities that do well in smaller “microflock” groups found in typical backyard settings. Common layer breeds lay an average of 3-5 eggs per week per bird, while rare breeds may not lay as frequently, but are notable for their appearance or personalities. All breeds are subject to availability at time of delivery. Minimum flock size is 3 birds. All birds come certified with our “health and hen” guarantee that they are free of disease for a 1 month quarantine period. Standard: Plymouth Rock, Austrolorp, Rhode Island Red, New Hampshire Red, Ameraucana (blue eggs), Easter Egger (blue eggs), Faverolle, Orpington, Marans (brown eggs). Bantam: Belgian Bearded d’Uncle, Bantam Cochin. The following breeds are either slightly more difficult to find, or need some additional considerations to ensure they will do well in your flock. Legbar (blue eggs), Barnevelder (brown eggs). If you notice something unusual with one of your birds, GCG will provide health consultations by email, phone, and if needed, an in-person house call. Please note that while we have extensive experience in chicken husbandry, we are not veterinarians. The purpose will be to assess the situation and best advise you on further action. There are some basic remedies that the GCG farmer can provide for the chicken before determining whether it may be a good idea to take your bird to the veterinarian. GCG Chicken Health Insurance is available only for chickens sourced through GCG, or chickens who have passed a comprehensive health inspection by our chicken expert. However, we do offer ‘A la Carte’ consulting if you do not have the GCG Chicken Health Insurance Plan.